Our re-entry into Bosnia was a very rainy one, so much so that we were wondering whether we should skip it completely and carry on into Croatia, which was ultimately our final destination. 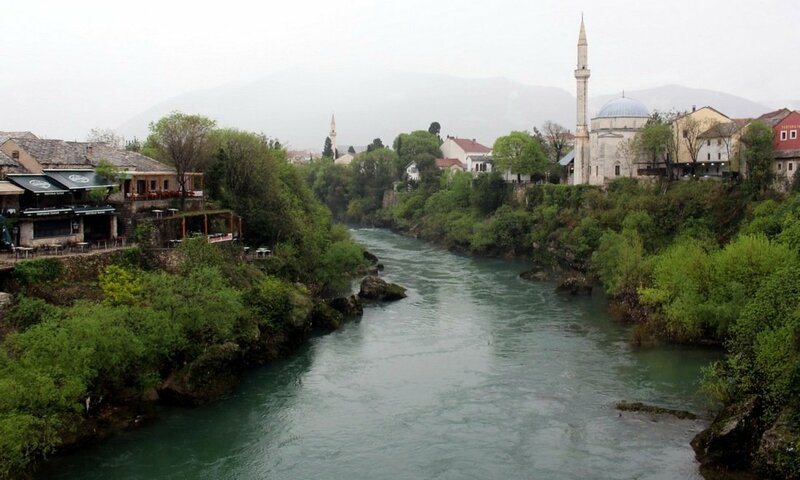 We decided to go ahead and braved the weather to our first stop en-route to Mostar, Blagaj, to visit a lesser known attraction of southern Bosnia called the Dervish monastery or Tekija. It is difficult to explain just how beautiful the location of this monastery is. Imagine an emerald green river gushing out of a cave in a cliff wall, and an imposing Ottoman building built right above it. 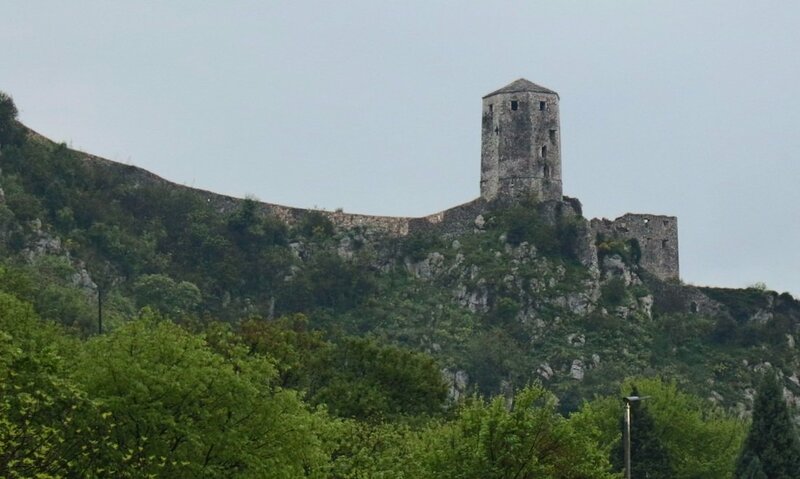 During the low season you can drive all the way down to it, but in the busier months, an easier stop would be the car park located just a few hundred metres up the road where you can park your car for a 1 euro fee. The best views of the monastery can be appreciated from the restaurant right opposite, accessible through a small bridge crossing the river. Smiles in the rain at Blagaj! The monastery was originally built for the Dervish cults and today is still considered to be a mystical place. Although it’s a popular tourist attraction in the region, we were the only ones there due to the low season and bad weather, so we could take our time to explore the site (and ‘enjoy’ getting soaked by the rain at the same time). Our second stop was Mostar, one of the main highlights in Bosnia, home to the famous Mostar bridge also known as Stari Most. We approached the town from the northern side and parked right off the main road. After a brief interlude with a parking meter with instructions we couldn’t quite figure out, a kind shopkeeper informed us that there was no need to pay for parking at that particular time of day. We walked straight to the old part of town near the Ottoman bridge where sellers had all kinds of souvenirs stands set up along with ice-cream shops and little food stalls. Walking along the wet and very slippery, cobbled bridge whilst avoiding the selfie sticks proved to be quite a feat. 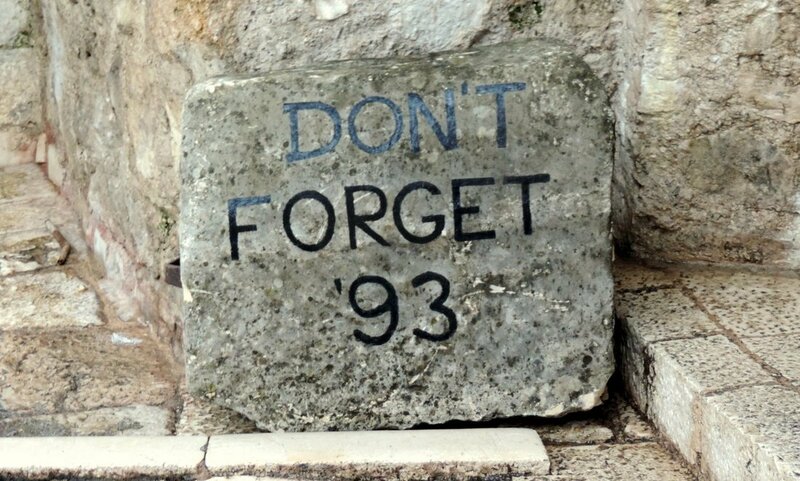 We managed to slide over to the other side where we came across the watchtower, home to the War Photo Exhibition and a small monument reminding passers-by of the Bosnian war, a reference to when the original bridge was bombed and destroyed. 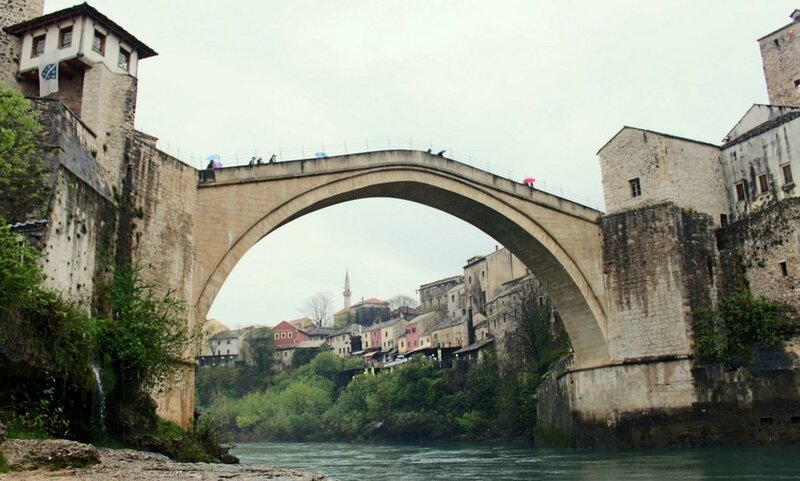 The Stari Most is not the original structure but a reproduction reconstructed after the end of the war and re-opened in 2004. The reproduction is faithful to the original structure, including the method with which it was painstakingly rebuilt. Stari Most is home to a small fraternity of professional divers who, in better weather conditions, entertain visitors by performing heart stopping dives down to the river 24 metres below. They are also known to train and assist intrepid foreigners willing risk the jump (at a fee of course), but this option is not frequently taken up – one can only presume why! 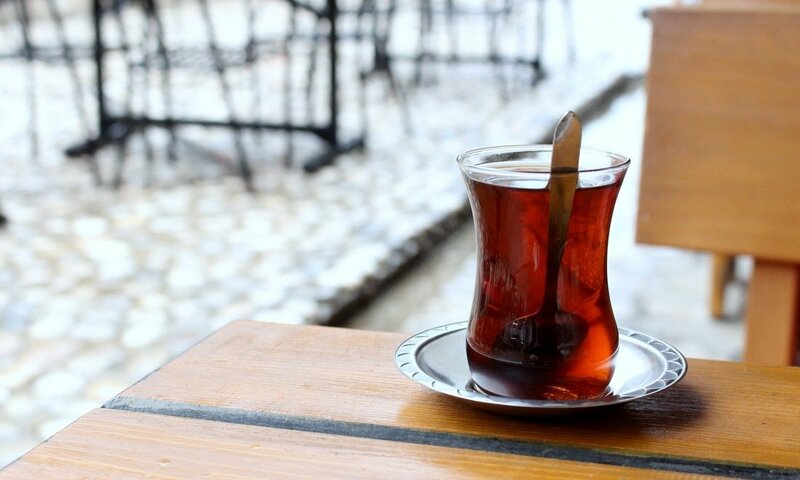 After some obligatory photo stops we walked along the old town and stopped for some Turkish style çaj. A glass of very welcome çaj! 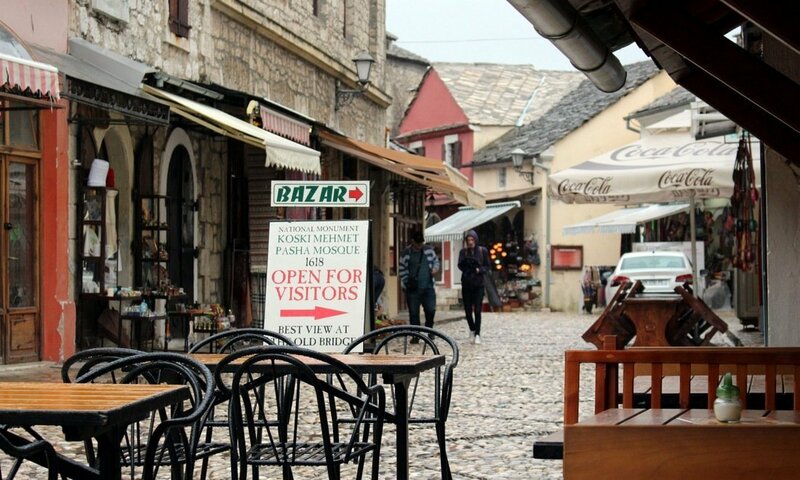 Our last stop was Počitelj, a small town with a pretty centre outside of Mostar, on the bank of the river Neretva. It was still raining heavily so we didn’t risk climbing all the way up to the castle but just walked around for a little while, admiring the Ottoman buildings every time we had the courage to peep out from under our umbrellas. The town is definitely worth stopping by for a couple of hours (in good weather); unfortunately we couldn’t get to enjoy it properly and heading back to Croatia seemed our best option at that point. My partner and I are visiting in July next year so fingers crossed for some better weather! Though it does look lovely and quiet in the off season!